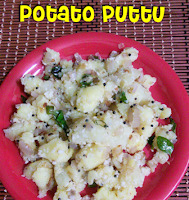 Potato puttu - the perfect side dish for sambar, rasam and rice varieties. This is similar to vazhaikkai puttu recipe and the only difference is the potatoes are gently mashed instead of grating. This potato puttu is very simple to prepare, so flavourful in each and every bite. 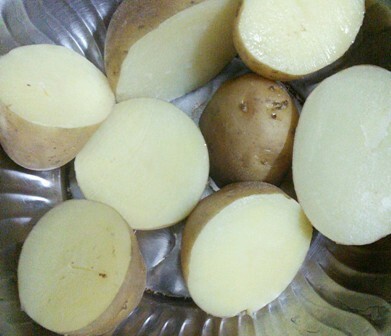 Everyone has a favourite potato recipes such as potato fries, mashed potatoes and countless recipes are there based on this friendly vegetable. 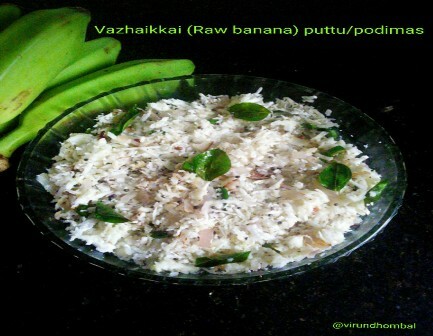 For me and my husband this potato puttu is an all time favourite side dish for lunch. 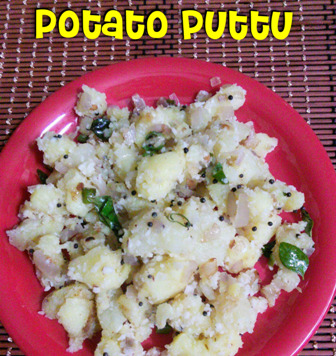 The main thing you have to follow while preparing this puttu the potatoes should not be overcooked or undercooked. If they are perfectly cooked the end result will be fantastic. 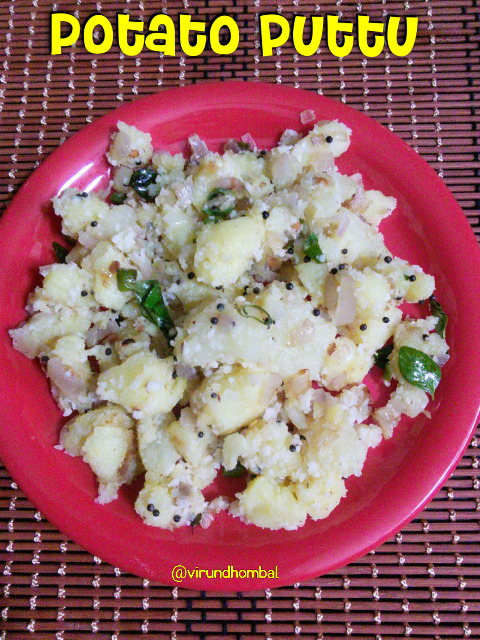 Potato puttu - the perfect side dish for sambar, rasam and rice varieties. 1. Take a small pressure cooker and add the washed potatoes. (You can cut them into half). Add 1/2 cup of water. 2. Pressure cook for 3 to 4 whistles. Allow the pressure to settle naturally. 3. Now take the potatoes carefully from the pressure cooker and allow them to cool. 4. Gently peel the skin and mash them with some solid pieces. (Do not mash them nicely). 5. Now add the required salt and grated coconuts to this mashed potatoes. Mix them evenly. 6. Heat 2 tsp oil in a kadai and add the mustard and urid dal. 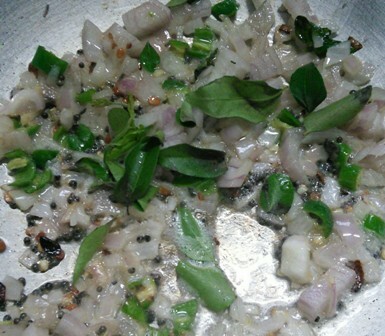 Allow them to crackle and add the finely chopped onions, green chillies and curry leaves. Stir and saute it for few minutes. 7. Next, add the potato mixture and give them a quick stir with the onions. Transfer them to the serving bowl. 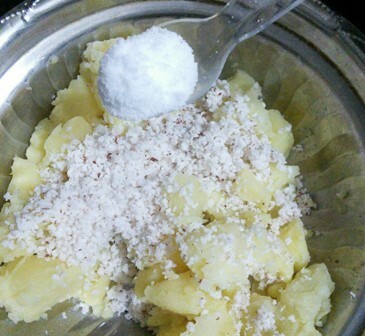 Quick and tasty potato puttu is ready to serve. Serve it with a hot sambar or rasam and enjoy your lunch with your family. 1. Take a small pressure cooker and add the washed potatoes. ( You can cut them into half). Add 1/2 cup of water. 2. Pressure cook for 3 to 4 whistles. 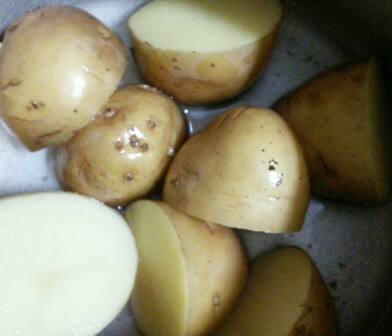 Allow the pressure to settle naturally.Now take the potatoes carefully from the pressure cooker and allow them to cool. 3. Gently peel the skin and mash them with some solid pieces. 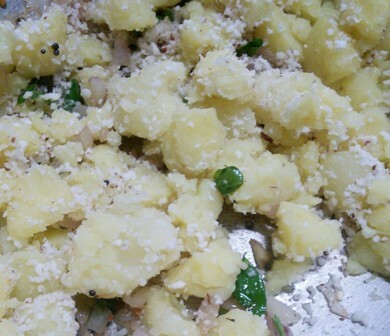 (Do not mash them nicely).Now add the required salt and grated coconuts to this mashed potatoes. Mix them evenly. 4. Heat 2 tsp oil in a kadai and add the mustard and urid dal. Allow them to crackle and add the finely chopped onions, green chillies and curry leaves. Stir and saute it for few minutes. 5. Next, add the potato mixture and give them a quick stir with the onions. Transfer them to the serving bowl. Quick and tasty potato puttu is ready to serve. 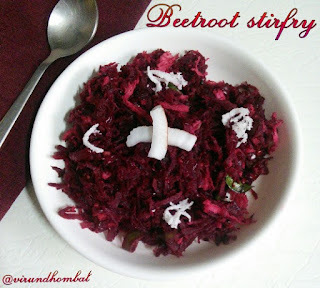 Serve it with a hot sambar or rasam and enjoy your lunch with your family.